There’s been a decent amount of activity recently about the new creative mind that’s needed to drive engagements and experiences across the full landscape of touch points. This recent article from Adotas sums it all up perfectly. With consumer behavior evolving toward a more empowered status—the definition of creativity has shifted from one-dimensional skills to a four-dimensional type of creativity that blends logical thinking with creative problem solving. 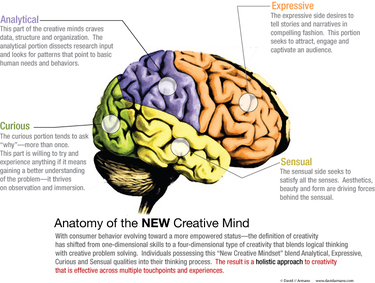 Individuals possessing this “New Creative Mindset” Download creative_mind.pdf blend Analytical, Expressive, Curious and Sensual qualities into their thinking process. The result is a holistic approach to creativity that is effective across multiple touch points and experiences.